DIE Lunæ, 26 die Novembris. Message from H. C. about the Canary Company Patent. Coinage Bill, His Majesty's Leave to proceed in it. Ly. Villiers' Petition against it. Jones, Ld. Hatton's Servant's Arrest. Gardiner committed to The Fleet. Salisbury, alias Clayton, committed to The Fleet. Dr. Wake to be attached, for decreeing a Process to be issued against him. Epus. Sarum. Ds. Custos Privati Sigilli. This Day the Lord Chief Justice of the Court of Common Pleas sat Speaker, in the Absence of the Lord Chancellor. To put their Lordships in Mind of Two Votes formerly brought up, concerning the Canary Company. ORDERED, That this House will hear all Parties concerned, touching this Business, on Thursday Morning next, at this Bar. 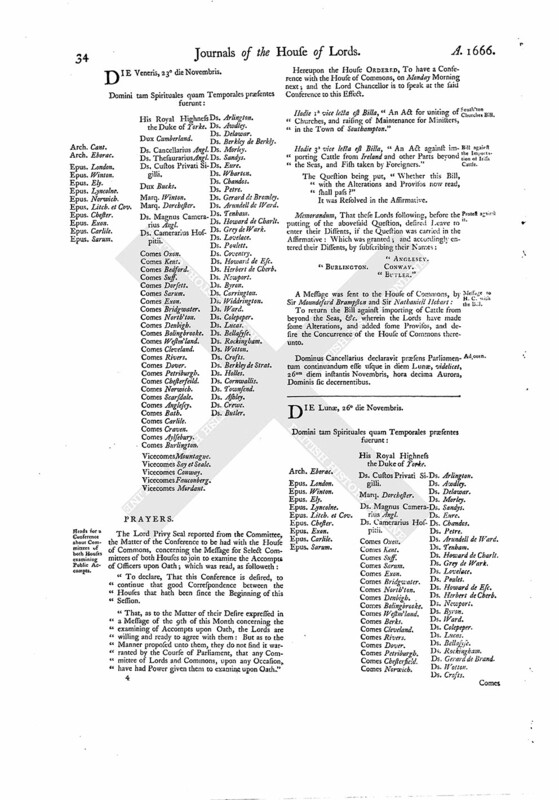 ORDERED, by the Lords Spiritual and Temporal in Parliament assembled, That the Bill, intituled, "An Act for enlarging the Time of Redemption of Mortgages made by the Earl of Cleveland," be recommitted to the same Committee to which the said Bill was first committed; whose Lordships are to meet To-morrow Morning, at Nine of the Clock in the Prince's Lodgings, and at such other Times as they please; and afterwards to make a full Report thereof, as they shall find Cause. The Lord Ashley acquainted the House, "That he and the Lord Treasurer have waited on the King, to know His Pleasure concerning the Bill for encouraging of Coinage; and His Majesty is pleased to give Way that it be proceeded in." Hodie 2a vice lecta est Billa, "An Act for encouraging of Coinage." Their Lordships, or any Five; to meet in the Prince's Lodgings, on Thursday next, at Three of the Clock in the Afternoon. It is ORDERED, That the Consideration thereof be referred to the Committee appointed for that Bill. 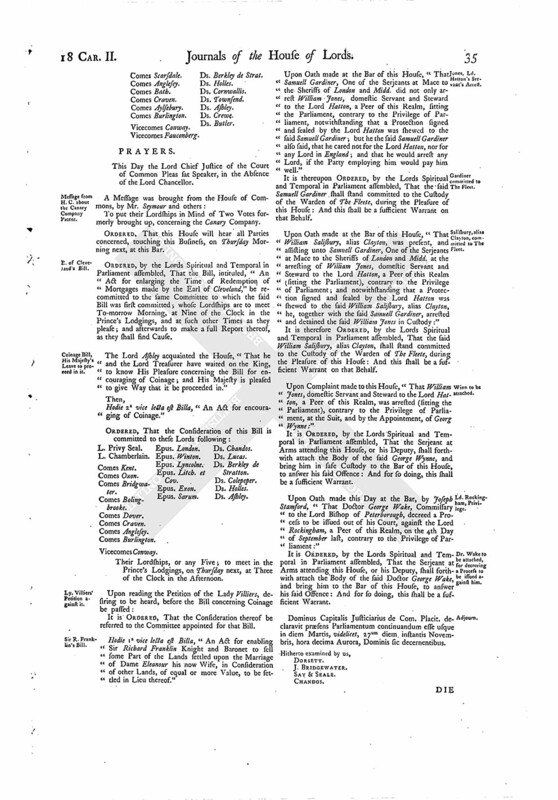 Hodie 1a vice lecta est Billa, "An Act for enabling Sir Richard Franklin Knight and Baronet to sell some Part of the Lands settled upon the Marriage of Dame Eleanour his now Wife, in Consideration of other Lands, of equal or more Value, to be settled in Lieu thereof." Upon Oath made at the Bar of this House, "That Samuell Gardiner, One of the Serjeants at Mace to the Sheriffs of London and Midd. did not only arrest William Jones, domestic Servant and Steward to the Lord Hatton, a Peer of this Realm, sitting the Parliament, contrary to the Privilege of Parliament, notwithstanding that a Protection signed and sealed by the Lord Hatton was shewed to the said Samuell Gardiner; but he the said Samuell Gardiner also said, that he cared not for the Lord Hatton, nor for any Lord in England; and that he would arrest any Lord, if the Party employing him would pay him well." It is thereupon ORDERED, by the Lords Spiritual and Temporal in Parliament assembled, That the said Samuell Gardiner shall stand committed to the Custody of the Warden of The Fleete, during the Pleasure of this House: And this shall be a sufficient Warrant on that Behalf. Upon Oath made at the Bar of this House, "That William Salisbury, alias Clayton, was present, and assisting unto Samuell Gardiner, One of the Serjeants at Mace to the Sheriffs of London and Midd. at the arresting of William Jones, domestic Servant and Steward to the Lord Hatton, a Peer of this Realm (sitting the Parliament), contrary to the Privilege of Parliament; and notwithstanding that a Protection signed and sealed by the Lord Hatton was shewed to the said William Salisbury, alias Clayton, he, together with the said Samuell Gardiner, arrested and detained the said William Jones in Custody:"
It is therefore ORDERED, by the Lords Spiritual and Temporal in Parliament assembled, That the said William Salisbury, alias Clayton, shall stand committed to the Custody of the Warden of The Fleete, during the Pleasure of this House: And this shall be a sufficient Warrant on that Behalf. Upon Complaint made to this House, "That William Jones, domestic Servant and Steward to the Lord Hatton, a Peer of this Realm, was arrested (sitting the Parliament), contrary to the Privilege of Parliament, at the Suit, and by the Appointment, of Georg Wynne:"
It is ORDERED, by the Lords Spiritual and Temporal in Parliament assembled, That the Serjeant at Arms attending this House, or his Deputy, shall forthwith attach the Body of the said George Wynne, and bring him in safe Custody to the Bar of this House, to answer his said Offence: And for so doing, this shall be a sufficient Warrant. Upon Oath made this Day at the Bar, by Joseph Stamford, "That Doctor George Wake, Commissary to the Lord Bishop of Peterborough, decreed a Process to be issued out of his Court, against the Lord Rockingham, a Peer of this Realm, on the 4th Day of September last, contrary to the Privilege of Parliament:"
It is ORDERED, by the Lords Spiritual and Temporal in Parliament assembled, That the Serjeant at Arms attending this House, or his Deputy, shall forthwith attach the Body of the said Doctor George Wake, and bring him to the Bar of this House, to answer his said Offence: And for so doing, this shall be a sufficient Warrant. Dominus Capitalis Justiciarius de Com. Placit. declaravit præsens Parliamentum continuandum esse usque in diem Martis, videlicet, 27um diem instantis Novembris, hora decima Aurora, Dominis sic decernentibus.